In order to maximize my four-day weekend, I flew out from Valencia on Wednesday night, and overnighted in Bergamo, a big Ryanair base of operations. Usual long line to board, using the built-in stairs on the 737. Tip: there's another line for the rear door! People like to complain about Ryanair, but I think it's quite fine. It's very predictable, and I think it actually gives you more room than some "full-service" airlines like Iberia (I put "full-service" in quotes, because within Europe they don't even serve water for free, just like Ryanair). Since Ryanair cleverly puts the safety card directly on the seatback, they did away with the seat pocket, and the seats also don't recline. These might seem like cheap moves, but I really think it's more spacious than others - certainly Ryanair and Vueling, which I flew on the return from Naples. I didn't have time to eat before the flight, and my plan in Bergamo was to go straight to the hotel to sleep, before an early morning flight to Naples the next day. So I ordered a meal on board, perhaps only the second or third time I've actually bought food on a flight in my life! I thought the food, and value, were pretty decent. Ryanair offers a "meal deal," where you can choose a main course, snack or dessert, and beverage for 10€. I chose a Chicken Tikka Masala, cranberry brownie, and hot chocolate. 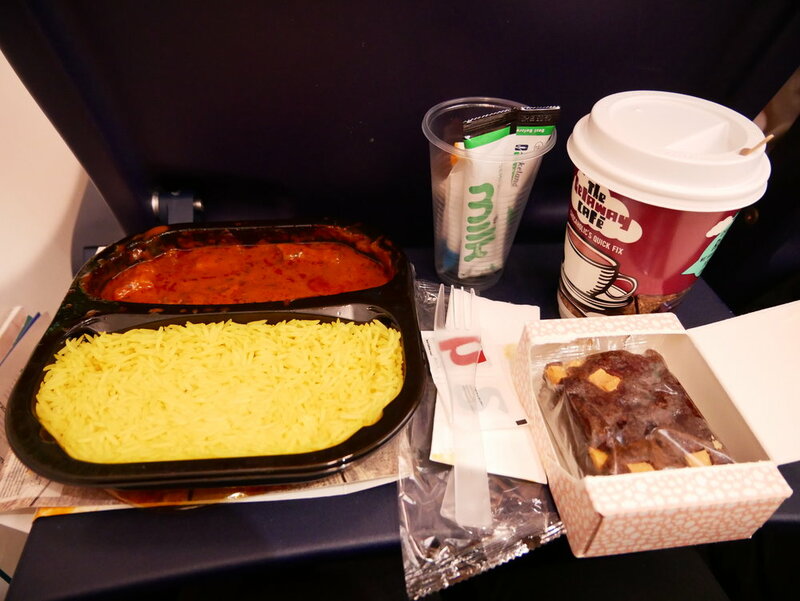 The Chicken Tikka Masala was nice and hot (unfortunately some liquid dripped out when the flight attendant handed it to me, and scalded my hand). Thanks to abundant use of tomatoes, the flavor was intense and respectably spiced. I don't really want to think how they can keep it shelf stable, but the ingredients didn't look alien to me. The brownie wasn't as moist as I would have liked, but it was still fine. And the hot chocolate was the usual powdered stuff that they also serve on EasyJet, and was served with a couple packets of milk (and even more sugar, which was definitely not needed). After arriving in Bergamo, went to my hotel for the night and then returned early the next morning. I found it interesting that there is a lounge both landside and airside, and both are Priority Pass lounges. Hoping that the landside lounge would be like in Bologna, where there's a direct entrance to Fast Track security, I paid a short visit to that lounge first. And indeed, there was an exit opposite of the entrance that led directly to the front of security! After security, there was the other lounge. 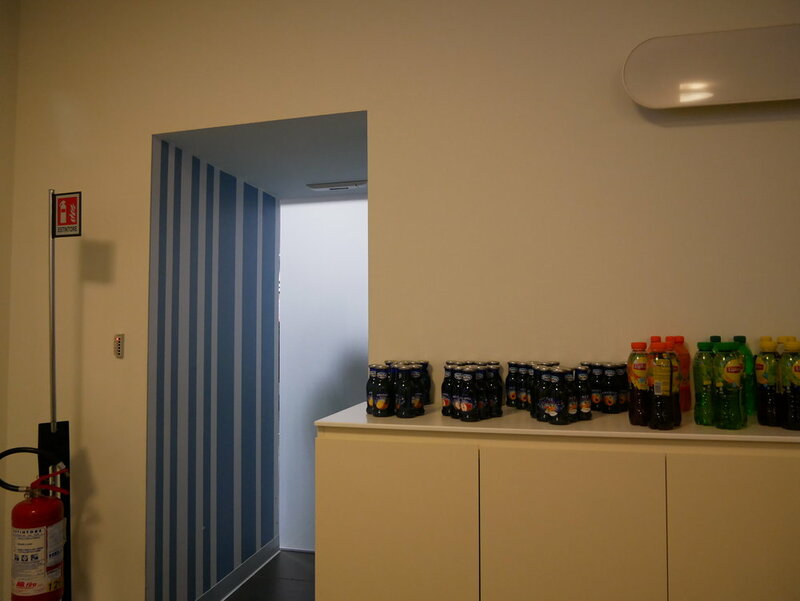 Like the landside one, this was rather drab, with packaged snacks and bottled drinks. There were some morning pastries though, and I picked up an apricot jam-filled croissant. And then it was time for some shut-eye on the plane, followed by my first glimpse of Mount Vesuvius, from the air! On the return from Naples to Valencia, I chose a late night departure on the budget airline Vueling on Sunday. (Vueling is part of the IAG group of airlines and is especially closely partnered with Iberia.) The flight would arrive in Barcelona around midnight, when I would then take an overnight bus to Valencia. Oh the sacrifices I make to maximize time at destination! At Naples Airport, there wasn't an airside lounge to zip me through security, but I was surprised that actually just showing the Priority Pass card was sufficient for Fast Track security. Wow! An unpublished Priority Pass benefit! There's only one VIP Lounge in the airport, which is shared among the airlines. With a closing time of 9pm, they actually advised me that I wouldn't have a lot of time in the lounge, which was fine. It was a pretty small lounge, with only 32 seats, but somehow it was more bright and less depressing than the ones in Bergamo. And besides the receptionist, and cleaner, there was a barista! As I wrote in my post about coffee, this was my last taste of Neapolitan espresso! Even here you can see they used the piston-type espresso machines. After leaving the lounge, and then standing in line for a long time for the bus to the plane, I finally boarded my first flight on Vueling. It definitely felt more cramped than Ryanair to me, with the regular seat pocket taking away legroom, and very long armrests which made it necessary to really contort oneself to get in and out of the seat. On this flight I chose not to eat or drink anything, so was uneventful though we did land late due to air traffic control. In Barcelona, I had a 1:25am bus back to Valencia. Between walking quite a distance through Barcelona's huge Terminal 1, to navigating the lower level to find the bus stop (not well marked), I actually didn't have to wait too long. At the departure time, there was still no bus to be found, and some other passengers on the bus and I started discussing whether we were in the right place since there really was no signage. But eventually an Alsa bus did pull up. On this overnight service to Valencia, the bus is a "Supra" class buss, which means 1-2 seating rather than 2-2 seating. Theoretically the seatback TV monitors were for entertainment, but I didn't see how to turn it on, nor was I interested in a movie since my main objective was sleep! It turned out to be a bit difficult to fall asleep because the driver and his colleague seated up front were real chatterboxes. I don't begrudge them though, because it was probably safer that the driver was entertained and awake for the journey. We made a planned 45 minute stop in the middle, for what reason I have no idea. We arrived in Valencia at 6:30am, a 5 hour journey. It's good to know of this bus from Barcelona Airport to Valencia, because it does open up flight possibilities with all of the low-fare competition going on at Barcelona.